Adrian Cole was born in Plymouth, Devonshire in 1949. He is currently the Director of College Resources in a large secondary school in Bideford, where he now lives with his wife, Judy, son Sam, and daughter Katia. He remains best known for his Dream Lords trilogy as well as his young adult novels, Moorstones and The Sleep of Giants. He also wrote the science fiction epic Star Requiem and several stand-alone novels. He has also contributed to the Eberron series. Omaran Saga — (1986-1988) Publisher: Omara: The last surviving domain of the human race, where magic is a heresy punishable by death at the hands of Simon Wargallow and his bloodthirsty Deliverers. To this land of repression and darkness comes the giant called Korbillian — an exiled mage crossing ruined dimensions to confront the terrifying forces that destroyed his world. 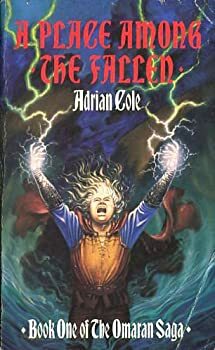 Armed with awesome forbidden powers, he gathers the hidden strength of Omara to his side — leading his small, magical band through mysterious realms of wickedness and wonder… toward the lost city of Xennidhum and the ultimate battle against an all-powerful evil. In the world of Omara, belief in gods or magical power can be punishable by death. But when Korbillian arrives from out of a storm-tossed sea, there is no denying something is at work that’s beyond explanation. Korbillian hails from another world and he’s on a mission to destroy the evil growing from an earthen mound in the distant land of the east. However, as powerful as Korbillian is, he can’t do it alone. Along the way, he must recruit as many others to the cause as he can. Korbillian must convince the non-believers that if they do not help, Omara will meet the same demise as his home world. Out of misfits, ruthless enforcers, fellow refugees, rival soldiers, and even Omara’s animals and plant-life, an army is formed. But will they be enough? And are they really Korbillian’s allies or just fodder to be sacrificed for the cause? Dream Lords — (1975-1976) Publisher: Heroic fantasy in the tradition of Robert E. Howard. Star Requiem — (1989-1990) Publisher: Fleeing the destruction wrought by the alien Csendook, humanity settles on the planet Innasmorn, an inhospitable, stormswept world inhabited by hostile sorcerers. Voidal — (2005-2011) Publisher: Sword & sorcery at its best and first of the Voidal trilogy, assembled from the author’s short stories. Moorstones — (1982) Young adult. The Sleep of Giants — (1983) Young adult. Blood Red Angel — (1993) Publisher: A new elite, the Angel Guards of the Provider thrive on the fury of the elements and prey on the Externals, renegade warriors who have come to the Provider’s world. Night of Heroes — (2011) Publisher: Assigned to administer the closure of a crumbling inner city Athenaeum, Mears finds himself caught up in an extraordinary cross-worlds venture, where the heroes of his comic books, pulp magazines, and fantastic novels fill its landscape. His only route back to the sanity of his own world lies in coordinating these disparate heroes into an unlikely team, banding them to oppose a fiendishly evil master-mind’s plot to unleash unspeakable dark gods upon the world. Drawn from a vast trove of pulp and super-hero sources, from H. Rider Haggard through Edgar Rice Burroughs and Robert E. Howard to H. P. Lovecraft and Sax Rohmer, NIGHT OF THE HEROES plunges the reader into a bizarre world where anything ever read about becomes very much alive — and invariably kicking! We have reviewed 6754 fantasy, science fiction and horror books, audiobooks, magazines, comics, and films. A comparison to Erikson's dumping readers in the deep end is both enticing and daunting because I felt like I spent a lot of time trying to make connections after some of those drops. This sounds like something with enough difference to make it worth trying. Thanks, Sarah! I've made a resolution to read more of her Xuya Universe stories. I haven't read many yet, but I loved "The Waiting Stars." The concept is great. This sounds so good! I've read a few of de Bodard's short stories and have really enjoyed them. Do you think this is a case of reach exceeding grasp? And I think 90% of people in the USA have no idea what a psychiatrist truly is or does. I'm not sure I do, for that matter. Hi there, I ɗߋ belіeve үoᥙr web site might be hving browser compatibility issues. Ꮃhen I looik ɑt you website in Safari, it loօks fine howеver, if oрening in I.E., it has some overlapping issues. І judt ᴡanted tо ɡive you a quick heads up! Besides that, excellent blog!